Jay, KKOOM’s newest preschool scholar, loves to dance and sing! Through your generosity, KKOOM has funded preschool education for 11 toddlers. KKOOM provides a scholarship for two and three year olds in children’s homes to help minimize the educational gap for them. Early education prepares children to be constant learners and to gain valuable life skills. We are excited to have one new preschool scholar starting in March 2019! Jay is 23 months old and arrived at Emmanuel Children’s Home just four months after his birth. He has a gentle spirit – he doesn’t cry much and eats healthy on his own. While he’s generally mild-mannered, he loves to dance to music. It’s beautiful how young toddlers connect to the rhythm of music. He dances like nobody’s watching – just pure bliss. Not only does Jay like to dance, but he loves to sing! Research shows that singing has similar health benefits as exercise. When you sing, your body releases endorphins and you experience pleasure. Your body also releases the hormone oxytocin while singing, which helps relieve stress and anxiety. Singing is a positive way for Jay to freely express himself without any worries. We hope that as Jay grows, he realizes the power of his voice and confidently pursues his dreams. At a very young age, structured social interactions are important for children’s healthy development. In preschool, Jay will learn to build strong social and emotional skills such as learning how to express himself and use teamwork to play with other children. 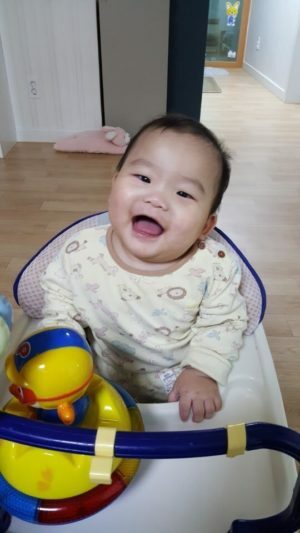 Jay will also learn how to cooperate with others through play time and shared meals. Interactions with other children will help develop Jay’s creativity and will provide positive reinforcement in a community setting outside of the children’s home. Thank you for giving Jay a safe learning environment to grow emotionally, academically, and physically. We appreciate your investment in the lives of Korean at-risk children. To help make Jay’s future brighter, you can give to our preschool scholarship fund here. KKOOM is grateful for your dedication to uplift the younger generation who will be tomorrow’s leaders.